Monday, 13 January 2014: Forty One Weeks Old. 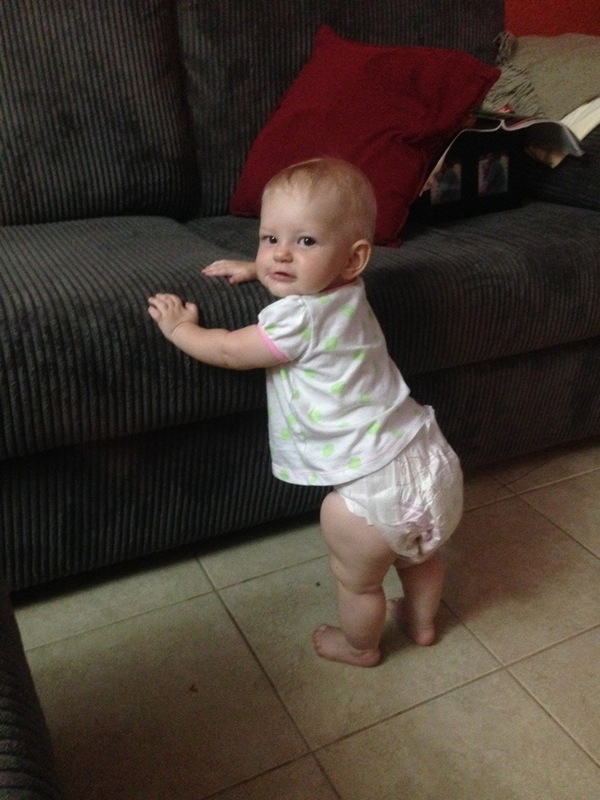 Ayla has been feverently practicing her walking skills by pretending to be a Furniture Crab. And by “Furniture Crab” I mean Ayla’s been holding onto the edge of the couch and shuffling her way along it… Like an upright, two-legged crab. We have an “L” shaped couch at our place with a big ottoman that fits perfectly in the angle to create a great gauntlet style pathway for Ayla to walk along. Not only is the gauntlet good for Ayla to practice as it gives her two edges to hold on to, it’s great for me because I don’t have to worry so much about her falling and hitting her head on the tiles. Although Ayla’s still trying to coordinate moving her arms and legs at the same time, she’s at the stage now where she can change direction and swap from having both hands on the couch to having both hands the ottoman. Ayla does make her way along the couch though, albeit slowly, but the distance she travels is mostly due to her edging closer and closer to things within grabbing distance, and once she’s thoroughly inspected, chewed and generally destroyed one thing she moves onto the next.